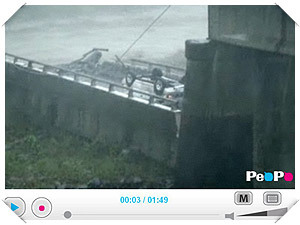 In the media frenzy that ensued following Typhoon Morakot’s devastating assault on southern Taiwan, television stations called on citizens to act as reporters and upload their first-hand footage, making it available for television stations to air. However, the ground for the concept of citizen journalism was prepared and sown two years ago, when PeoPo (People Post) - PTS’s citizen journalism platform - was established. In the past two years, PeoPo has already amassed a citizen-journalist base of over 3000 long-term members across Taiwan, providing concern and attention on important local issues. On August 7, when Typhoon Morakot began bringing extremely torrential rain, citizen journalists in the south began uploading footage onto PeoPo, reporting that some places in Tainan had already begun flooding. After the Zengwun River breached its banks, indigenous villages of Laiyi Township, Pingtung County, were placed in immanent danger. The speed at which the devastating landslides in Zhongpu Township, Chiayi County were captured by citizen journalists – far quicker than any of the media stations – made the mobility of citizen journalists clear to the nation. On August 8th, after the devastation in southern Taiwan was continually broadcast in the media, PeoPo set up the ‘Morakot Disaster Zone’, which received hourly updates by citizen journalists uploading their latest reports. Although the flood period only lasted a few short days, PeoPo accumulated hundreds of disaster reports and flood-related news. 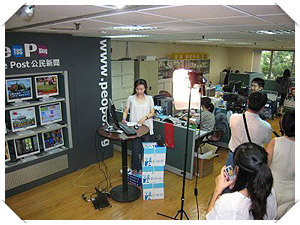 In the PeoPo News offices, temporary recording equipment was installed in order to provide fast coverage and the speedy broadcast of citizen journalists’ disaster reports. Perhaps even more moving than the citizen journalists’ reports, was the enthusiastic response to the relief effort, which after PeoPo’s continual coverage, found funds arriving in from far and wide. On top of this, in spite of the fact that some citizen journalists were themselves victims of the disaster, they insisted on putting aside their own grief and continuing to record the disaster-relief effort. Grassroots groups in Taitung personally witnessed that while SNG (Satellite News Gathering) vehicles tended to retreat after the story waned, the new upsurge in citizen journalism meant that there was follow-up coverage, ensuring victims in need received help and that there was supervision of the post-disaster reconstruction. As a direct result of the disaster, on August 19 PeoPo raised a citizen journalism workshop at National Taitung University, empowering volunteers on the ground to protect their communities through the power of the lens. Morakot-related issues have gradually been forgotten by the mainstream media, and it is only through continued coverage by citizen journalists that attention has remained on post-disaster developments. With the purpose of encouraging those citizen journalists who are dedicated to the long-term follow-up coverage of the Morakot Disaster and related stories, PeoPo has provided 21 sets of digital video equipment for long-term use. The equipment has been transferred to 21 NPO and NGO organizations in Kaohsiung, Pingtung, Chiayi, Tainan and Taitung, enabling citizen journalists to continue providing visual images of the post-disaster reconstruction and protecting their communities. We sincerely hope that through the unceasing growth of PeoPo’s mobile media force, not only will the disaster area receive the continued support and concern it deserves, but that even more people will touch base with the grassroots voice of Taiwan!